Brakes are a very important part of your car. Keeping the engine in your car in good condition is very important, as the repairs to a broken engine can be costly and time consuming. Brakes don’t often get the same attention the motor in your vehicle does because they usually work well, don’t require much maintenance and when they do, you can usually find a $99 special to get them changed. The brakes in your car are indeed a relatively simple system so they don’t require much maintenance, but they are as important if not more important than the engine in your vehicle. The ability to stop during regular driving or emergency situations depends on the good upkeep of your brakes. There are two different kind of brakes installed on passenger cars and trucks today – disk brakes and drum brakes. Nearly every vehicle on the road today has disk brakes a least on the front and more and more cars are being built with disk brakes on all 4 wheels. Drum and disk brakes are very different devices that accomplish the same goals. 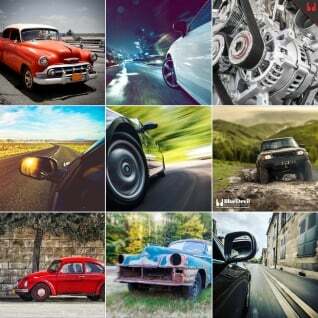 For the sake of simplicity, and since most cars have them, this article will only deal with disk brakes. Disk brakes are called such because the main stopping device is a disk that is installed just inside the wheel and tire of your vehicle. This disk is held on by the wheel and lug nuts and spins with the tire of your car. There is a caliper that fits over the disk and has pads on either side of the disk. A piston, or up to 4 on some vehicles, push against these pads when the brake pedal is applied by the driver. The force of the pistons causes the pads to squeeze the disk creating friction and making it more difficult for the disk to spin. As the disk slows down it also slows down your wheels and tires and ultimately your vehicle. The most common problem with a disk brake system is squeaky brakes. There are a few reasons you may find your vehicle getting squeaky brakes, but the most common is some component sticking or getting stuck in the system. When you press or release the brake pedal the amount the pistons and pads move is almost microscopic. Because of this small amount of movement it’s easy for the pads to get stuck in a certain position causing them to vibrate, ring or squeak the next time they are applied. This can be cured using “Disk Brake Quite” or “caliper lube” in the right places. Start by removing your brake caliper and applying lubrication to the back of both brake pads and to any surface which may slide during braking including the caliper slides. This can help everything to move as it should during braking, keeping the squeaking or squealing from happening. A similar noise may occur when you are not braking at all like a squeaking or even a grinding. Assuming your brakes pads still have plenty of friction material on them, it may simply be due to rust on the brake disk. The brake disk is made of a steel alloy that is prone to rust in wet environments like we all drive in. The section of the disk where the pad rubs for braking will always remain clean as long as you drive regularly but the outer edge or inner part of the disk will rust over time. As your brake pad wears down, it may come into contact with a new area of the brake rotor where it will contact the rust, even if you are not applying your brakes. This symptom should go away after a few days of normal driving as the brake pad clears the rust from the new area. Be sure to inspect your brakes regularly to ensure you have plenty of friction material on your brake pad as a worn brake pad can make a very similar sound. The last problem disk brakes can have is for the disk to lose its circular shape. Over time, due to heat, water, hard braking or a combination of these, brake disks tend to lose their true shape and warp. This warping of the brake disk will cause it to push against the brake pads every time the out-of-round section passes through the brake caliper. This can cause a vibration in your steering wheel, even when you are not using the brakes, a ‘whomping” sound or a pulsation in your brake pedal during braking. An out of round brake disk, or warped rotor, will cause excessive wear of your brake pads and could lead to premature failure. In some cases the brake disk can be machined back to its original shape, but often it is more economical to simply replace the warped brake disks. Regularly checking the condition of your disk brake pads can keep you from costly repairs and stopping more slowly can help your brake disks maintain their shape longer. If you experience any of the sounds or conditions mentioned above, check your brakes to make sure they are in good shape and your vehicle is safe to drive. It sounds like your problem is that your brake pads aren’t floating in the calipers causing them to squeak. Try removing the pads and adding grease to the back of the pad where it rubs the caliper or piston and to the edges of the pad where it slides. That should allow your calipers to float and seat in the caliper and should eliminate the squeaking. Thank you for your question. It sounds like your brake pads may be worn out. We recommend having them replaced as soon as possible to avoid additional costly repairs. I have a regular squeak that started on the right side when I would turn the corner. Then after awhile it started on both sides. A couple people stated its my hubs/wheel bearings. But after I read the article on the Hubs/Wheel bearings I don’t have any of the symptoms except the constant shaky behavior when pressing the breaks. I noticed rust on my rotors around the outer edge, so I am curious as to maybe that is causing the squeaking because now it is squeaking rolling down the roads. Almost as if there is a piece of dirt or hard mud between the breaks and causing it to squeak. Break pads are about to be changed this weekend, as I am sure they are worn. When pulling into my parking spot today at work the breaks grinded almost as if it was metal on metal. If all of that makes sense please let me know what I should replace after the breaks if the squeak is still there. It sounds like the noise you have is an indication that your brakes were getting low and the grinding indicates they’re worn out. Since you get shaky behavior when you press the brakes we would recommend having your brake pads and brake rotors changed. We’re fairly confident that will fix your problem, but if it doesn’t you might consider checking for a squeaking suspension component. You can start by reading our article about that here: https://gobdp.com/blog/squeaky-suspension/. Thanks for your question about your Grand Am. Based on the grinding, whooping and wheel locking up it sounds like you’ve got a bad front wheel bearing. Depending on what year your car is, you most likely have a sealed bearing and it should be relatively easy to replace. It is also possible that your CV joint is bad, but for it to lock up like you described you would have noticed a tear in the boot and a lot of grease. My 04 chevy Tahoe z71 makes a grinding sound while driving and pressing the breaks . It also shakes a bit when I get up to 45 50 mph. I don’t get any shaking or noise when I turn tho. Any idea what’s going on? Thanks for your question about your Tahoe. Based on your description of the noises you’re having the first thing we’d recommend doing is having your front brakes checked. It sounds like your front brake pads are worn so low they’re digging into your brake rotors. The shaking may be due to your brakes being so worn, or a tire that is out of balance. After you have your brakes inspected or changed, try rotating your tires and seeing if the shake changes or goes away. If it changes, have your tires rebalanced. If it goes away, then continue to rotate your tires every oil change. I have a 2016 Ford Fusion. There is an intermittent squealing grinding noise from the front right wheel that goes away when braking. Any ideas what it could be? Thanks for your question about your Ford Fusion. It sounds like you may simply have some rust build up on your front brake rotor as it would cause the problems you’re describing. Since your car is so new, our recommendation would be to take it to a Ford dealership as any problem like that should be covered under your new car warranty. Got the same problem but on a 2014 Accent…could cleaning the brakes solve the issue? Thanks! Cleaning the brakes may solve the issue. Built up dirt/sludge could cause the brakes to squeak and give you the impression of your pads being worn. Give that a try and see if it solves the problem. If not, you may want to look into bringing the vehicle to a brakes specialist. I have a 98 Mazda Protégé. When breaking and speed 10mph or lower i hear and feel grinding on the passenger side that gets louder as I come to a stop. I know I need a lower control arm on that side and possibly a cv joint on the drivers side as i’m getting clicking when turning and the boot appears seperated, just wondering if this grinding means a new bearing, brakes, or if it’s a symptom of the problems I mentioned above. I have not taken the wheel off but the part of the brake pads i can see looks more worn on the grinding side. Thank You. Thanks for your question about your Mazda Protege. It does sound like you’ve got a brake pad that is worn out, but it is possible that your worn suspension components are allowing your wheel to move more than usual during braking allowing the pad to come in contact with some of the rust on the outside of your rotors. Either way we would recommend pulling the wheel off and checking your brake pads to make sure you aren’t damaging your brake rotor. Hello, very helpful site, I appreciate the time you invest in this. Just had the car out last night and no noise, nor has there been. Today, out of nowhere is a low kind of moaning sound (maybe a little wavy?) from the front right tire of a 99 toyota Rav4. I initially looked at your article on wheel bearing noise, but this happens I think in a straight line and at lower speeds (maybe 10-20mph.) Though I may have notice some noise while turning as well. The noise was not constant. My initial thoughts were bearings or CV, but that article said lower speeds may indicate brakes. Any thoughts would be appreciated. Thanks for your question about your Rav4. Usually, break noises only happen at extremely low speeds, below 5 MPH. The noise you’re describing actually sounds more like you’re tire pressure might be low, or it might be time to have your tires rotated due to poor read wear. You can try rotating your tires and if the sound moves with the tire then that is your problem. If it is a bad wheel bearing or CV joint the sound should get worse over the next 100 miles or so. I have a 2005 Honda Odyssey with 150,000 miles on it. I replaced the rotors and pads last June with premium pads. This December I started to get a humming in the left front wheel at 40 miles an hour and up. When I lightly touch the brakes the humming stops. I removed the front pads and cleaned the guides and made sure that they moved freely. I chamfered the edges of the pads about 1/16″. The problem persisted. I try to turn right and left when driving and there is no increase or decrease in the noise. My question is do I have a faulty wheel bearing, too hard pads, or a tire problem? Thanks for your question about your Honda Odyssey. The one problem you didn’t mention was a warped brake rotor. It only takes one hard stop in the right conditions to warp a rotor and it would cause the problems you’re having so you may start by having your rotors checked for flatness. If the noise has gotten louder as you’ve put miles on then our assumption would be that you’ve got a bad wheel bearing or CV joint. You can check your CV joint by turning in a tight circle and listening for clicking. It doesn’t sound like you’ve got a tire problem, but you can always try rotating your tires to see if the humming moves with the tire. Thanks for your question about your F150. The grinding sound you’re hearing could be a brake pad issue so you may just do a quick check of both sides of your brake rotors to see if there are grooves or notches indicating the noise is coming from the brakes. It could be your wheel bearing but if it is bad enough to grind, you would certainly be able to feel play in your wheel. For information on how to check wheel bearings, check out this article: https://gobdp.com/blog/bad-wheel-bearing/. If your truck is 4 wheel drive it is also possible that the sound you’re hearing is coming from your automatic locking hubs. I have an 03 Chevy trailblazer. When I start to drive I hear like a grinding sound coming from the front. What could it be? Thanks for your question about your Chevy Trailblazer. The most common cause of grinding sounds like you’re describing are from excessively worn brake pads causing metal on metal contact and the grinding sound you’re describing. Our first recommendation would be to have your brakes checked by your mechanic to make sure your vehicle is safe to drive. I have noises in my 05 Trailblazer that are pretty certainly coming from front driver side. It started a few weeks ago as a ‘clicking’ noise driving down the road. Was going about 50 and it just started clicking. We stopped and looked, didn’t see anything unusual and drove home. The clicking noise was very intermittent. Some days I could make an entire trip to work and back or whatever and wouldn’t hear it at all. Replaced brake pads. Noise continued, became less and less intermittent. Almost sounds like something is hitting something underneath. Rotational, like sticking something in bike spokes. Speed doesn’t matter. Nothing in steering wheel or brakes/pedal. (no wobbling, shaking, or anything unusual in pedals. We drove it 175 miles out of state and back with the noise intermittent and had no issues. No trouble turning (does not change noise, does not “clunk” or make other noises) It got much worse and started grinding like brake was sticking. Changed caliper. Bought sway bar link, haven’t changed link yet. The grinding and noise went away for about a day after caliper change. Came back. Gets pretty scary loud and constant at times. Very rotational. Sometimes braking makes it stop, sometimes turning the wheel slightly makes it stop…or those things could be very coincidental. Changed CV axle last night as the vehicle had started to shake a bit yesterday. Still there. Still clicking, now squeaking even more, still a dragging sound. Before last night, the driver’s side front tire was harder to turn than the rest, but easier after changing CV and putting back together. Like I said, rotational sounds on all of it. Tried jacking up and accelerating to mimic the noise, but nothing. Have to drive it as I have to be able to get to work, any ideas? Thanks for your question about your Trailblazer. you’ve done a great job replacing the parts so far that we would recommend replacing based on your description of the sound. If you haven’t yet, you may consider replacing your front brake rotors to see if that is possibly causing the noise you’re hearing, but based on your description it sounds unlikely that would be the case. Our best guess is that your wheel bearing is worn and needs to be replaced or there is a problem with your 4 wheel drive engagement system. For more information about wheel bearing issues, try reading our article about that here: https://gobdp.com/blog/bad-wheel-bearing/. Is it normal for my 2004 Pontiac Grand Prix GT which I got recently (only 65000 miles) to make a slight squeaky/squealing sound during the first few brake applications (only during stops), then goes away after driving it awhile? The sound occurs in the front. I believe the front brake pads are around 3-5mm. I live in the desert area of California. 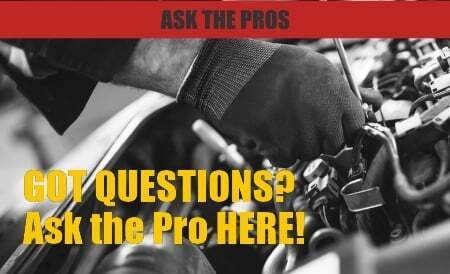 Thanks for your question about your 2004 Pontiac Grand Prix. It isn’t unusual for brakes to squeak or squeal occasionally, especially with light brake pedal pressure, especially if they’re more than halfway through their useful life. To see if that is the case, you could try removing the brake pads and lubricating the back of the pad where it contacts the caliper and the sides of the pad that contact the slides. You may also try removing the caliper from the bracket and lubricating the caliper slides to make sure you don’t have a frozen caliper and both brake pads are applying even pressure to the disk. If that doesn’t quiet things down, you may have to replace the pads to keep things quiet. Thanks for your question about your 2007 Cadillac SRX. We’ve found that often times if a noise or problem arises after a maintenance item it’s likely something wasn’t done correctly. You can try checking your brake pads and calipers to make sure you don’t have a stuck caliper and that your brake pads are lubricated and floating freely to see if that quiets things down. If that isn’t the case it is possible that the inexpensive bearings you used have failed already, but that seems relatively unlikely. The last trick you can try is to rotate your tires and see if that changes the sound at all as poorly worn tires can sound a lot like a bad wheel bearing. i Have a 1992 Ford F150 and I noticed a few days ago it is making this scraping like noise when I make left turns. It goes away when I press the brakes. Sometimes i hear it while driving but it will stop when I press the brake and come back when I release. This noise comes and goes. I can go a few days and not hear it. Also if i carefully and slowly make left turns, you do not hear it. The complete tie rod has been replaced but my pivot axle bushing or axle pivot bushing need replacing. Could that be an issue? I have not really drove this truck in several months. I would drive it around the block or just crank it up. Could it just sitting there cause this? Thanks for your question about your Ford F150. Based on the noises you’re hearing, our guess is that your problem is just rust build up on your brake rotors, especially since you don’t often drive long distances. As described in this article you can try getting your brake rotors resurfaced or even replaced. The problem is possibly coming from your axle pivot bushing, but it seems unlikely. Hi there! I have a 1999 Toyota Solara which I purchased about a month ago. Two days ago, I noticed a grinding noise coming from seemingly the passenger side, which only manifests after driving a few miles. I first noticed it while in stop-and-go rush hour traffic. The grinding appears randomly after some time of braking and acceleration at low speeds, but the grinding isn’t limited to when I am applying the brakes; after it begins grinding, even moving forward it makes the same noise, in an uneven manner, as if something is rubbing unevenly as the wheel turns. I had not previously noticed any squeaking, soft brakes or other signs of worn pads. I’m curious if it is a bearing, or the seller had not mentioned any signs of prior brake wear and it is in fact pads, though I’ve never known them to continue grinding despite the brakes not being applied. Thank you for asking about your Toyota Solara. Based on your description, it sounds like you may have a wheel bearing that is going bad. The fact that you are hearing grinding even when the brakes aren’t being applied would lead us to believe that it is not an issue with the brake pads being worn. You can check to see if the heat shield is bent and knocking into the rotor or if you have something foreign stuck between the rotor and the dust shield causing the grinding sound. If you don’t find anything and the heat shield does not appear to be bent, it is more than likely that you will need to replace the wheel bearing. Hello! I have squeeling sound coming from my 2008 Hyundai Elantra when I apply the brakes, however, front brake pads and rotors were replaced four months ago. Could the pads have worn this quickly? Thanks for your question about your 2008 Hyundai Elantra. It is possible that your brake pads have worn very quickly if you’ve driven a lot of miles or you are hard on your brakes. Brake pads usually last 20,000 to 50,000 miles depending on the car and how it is driven. Since it has been such a short time, our best guess is that a pad is simply out of alignment. 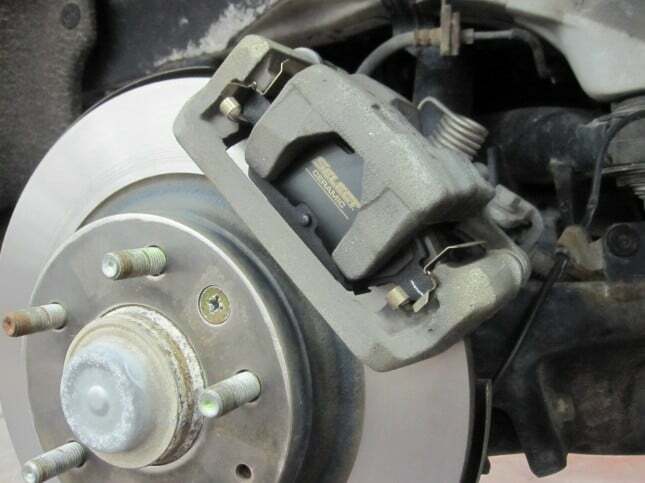 If the shop who installed your brake pads didn’t properly lubricate the caliper slides or the sides and back of the brake pad it could simply be stuck causing the squealing you are hearing so you may consider taking your car back to the shop that did the work and asking them to inspect the pads and calipers. So, my front drivers side inner and outer tie rod broke while I was driving home from work. When this happened, I lost complete steering and my rear wheels locked up. Why would the rear wheels lock? Thanks for your question, and we hope that everyone was alright when your car broke. If your vehicle is all wheel drive then the rear wheels are connected to the front wheels so if one of your front wheels turned out or skidded then it could have caused your back wheels to lock up as well. If your vehicle isn’t all wheel drive, or your front wheels stayed straight when everything broke then it’s possible some of the debris from the tie rods breaking stuck in the wheel or whatever impact caused the tie rod to break also damaged your rear wheels. A noise that seems metal with metal, scratching, and starts after 10 min. driving and gets louder with the miles, but dissapears completely when I just put my foot on the break pedal or turn suddenly right? I have changed the break caliper on the left side, so it seems a wheel bearing, but I dont get why that noise stops when I press the breaks. 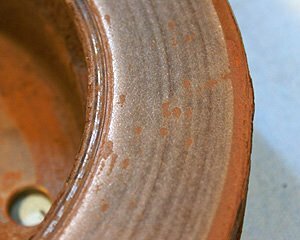 There’s a good possibility that a rock, or some other type of debris, has gotten lodged between the rotor and the backing plate, causing the noise you are hearing. You should be able to just have the rock/debris removed and be on your way. Also, sometimes the backing plate behind the rotor gets bent and it scrapes against the rotor. That also could be the cause of the metal scratching sound. Hope this helps!